The Adv. of Huck Finn: 50-Word Prereading Crossword—Great Warm-Up for the Book! NOTE: This puzzle is meant to be used before students read the book. Since most answers consist of only one word, students will benefit more from the use of a thesaurus than a dictionary. FYI: This puzzle includes the 25 Words to Know from the companion product THE ADVENTURE OF HUCK FINN edition of BOOKMARKS PLUS. Students can refer to their bookmarks for definitions as they read the story as well as to a list of main characters, author information, and more. Students and teachers alike love these handy, 4-star-rated reading aids! Also, to reinforce meaning even more, I have created a synonym/antonym crossword over the same 25 words. See list below. USE ALL THREE PRODUCTS TO REINFORCE MEANING! Like my products? Take a look at my LOOKING GOOD ON PAPER line—great writing lessons, some barely touched on in textbooks, based on my years of teaching “in the trenches”! Don’t miss my other unique products over THE ADVENTURES OF HUCKLEBERRY FINN shown below. View them in my store! •	Bookmarks Plus: THE ADVENTURES OF HUCKLEBERRY FINN edition—Handy Reading Aid! Helps students keep track of characters and provides definitions for new words—and so much more! •	THE ADVENTURES OF HUCKLEBERRY FINN: Trivia Game—Fun for the Whole Class! My ThemeQuotes games are the only games that link famous, value-promoting quotations to the themes of the books you teach! 300 questions! Students work in teams to play this cross between Wheel of Fortune™ and Trivia Pursuit™ game! 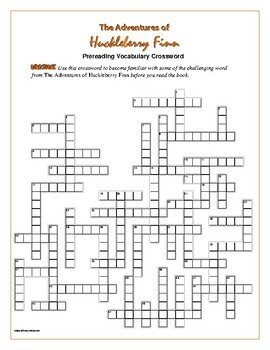 •	THE ADVENTURES OF HUCKLEBERRY FINN: 50-word Prereading Vocabulary Crossword—Use with Bookmarks Plus and the Huck Finn Synonym/Antonym Vocabulary Crossword to reinforce meanings of new words! •	THE ADVENTURES OF HUCKLEBERRY FINN: Synonym/Antonym Vocabulary Crossword—Use with Bookmarks Plus and the 50-word Prereading Vocabulary Crossword to reinforce meanings of new words! Helps prepare students for reading the book! 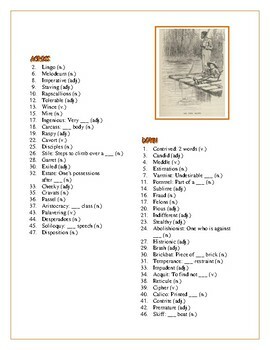 •	THE ADVENTURES OF HUCKLEBERRY FINN: 10 Quotefall Word Puzzles—Unique! Each quotefall is a quotation from the book. Students form individual words of the quotation by transferring letters from above the double line of the grid to squares in the columns directly below. Students love these puzzles—and they’re great spelling workouts! •	THE ADVENTURES OF HUCKLEBERRY FINN: Complete the Simile Crossword Students use their knowledge of the book, their knowledge of language, and their imaginations to complete similes from the story! A great way to teach figurative language! •	THE ADVENTURES OF HUCKLEBERRY FINN: Anagram Crossword Students decipher common terms from the novel. The puzzle can be challenging, but, as with all crosswords, each time students enter a correct answer, they are provided with clues for the next. •	THE ADVENTURES OF HUCKLEBERRY FINN: 4 Reading-for-Detail Crosswords—Based on the Novel! Great objective test reviews! •	THE ADVENTURES OF HUCKLEBERRY FINN: “Creturs” Crossword—Fun crossword based on the animals mentioned in the book! •	THE ADVENTURES OF HUCKLEBERRY FINN: 10 Word Searches—Based on the Book! 10 categories: What Characters! ; Jim; The Great Escape; Those Rapscallions! ; The Peter Wilkes Ordeal; Animals Galore; The “Murder” of Huck Finn; Tom’s Gang of Robbers; Life on a Raft; Sarah Mary Who??? •	THE ADVENTURES OF HUCKLEBERRY FINN: In the Words of Huck—Focuses on Dialect! Includes 43 words that Huck adds his own spin to! •	THE ADVENTURES OF HUCKLEBERRY FINN: Old New Words—REALLY UNIQUE! Focuses on 41 outdated words from the story. Challenging but fun! •	THE ADVENTURES OF HUCKLEBERRY FINN: 10 Cryptograms—Encoded Quotations from the Novel! Students decode 10 thought-provoking quotations from the story! Each cryptogram puzzle has its own code. Who doesn’t love a code? •	THE ADVENTURES OF HUCKLEBERRY FINN: 16 Theme-Related Quotations + Teaching Ideas Well-researched quotations by some of history’s greatest thinkers that relate to the theme of the book! —100s of unique products over most-taught literature!